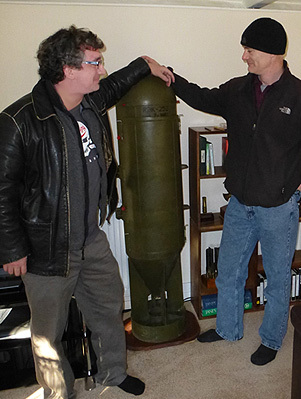 With Colin King (right) in his home outside London. The cluster bomb in the former living room of 60’s rock band Manfred Mann just outside London no longer carries as deadly a cargo. It’s been converted into a cabinet and now only contains a few bottles of whiskey. Landmines of all varieties and nations line the bookshelves alongside instruction manuals on how they can be safely removed from the ground and defuzed. Most of the manuals were written by the current owner of the 400 year-old home, our host, Colin King. Outside Colin’s house, in his multiple toolshed-turned-workshops are boxes and shelves piled high with defuzed mines and surrogates of ordnance he has made here on site. These replicas, used for mines risk education and clearance training are nearly impossible to tell from the real thing with the naked eye. 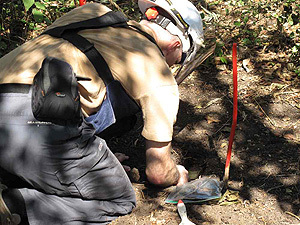 King not only “wrote the book” on landmine and unexploded ordnance removal, he updates it every year as the author of Jane’s Mines and EOD Operational Guide. In the early 1990’s, before Princess Diana brought the landmine issue into to the public consciousness, Colin was was leading the first team to train Afghan deminers in northern Afghanistan at the birth of the humanitarian demining movement that ultimately led to the Nobel Peace Prize-winning campaign to ban landmines. The landmine ban treaty was signed 15 years ago this week. The ban has resulted in a precipitous drop in landmine victims over the last ten years due to countries no longer using the devices (Syria being the only exception in 2012), effective mines risk education programs and landmine and UXO clearance projects having removed threats from communities around the world. But what of the landmines that are still in the ground? Some of them have been lying in wait for decades. Will they remain a threat for generations after the ban? 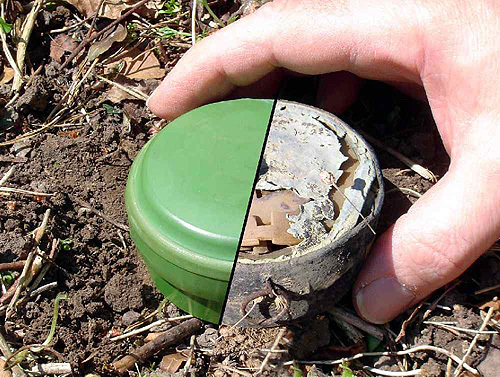 King, with support from the US Department of State has been lifting 30-year-old landmines and cutting them open to learn more about their lifecycle with the ultimate goal of smarter, cheaper, prioritized clearance. Colin removes a landmine for study. Colin’s slideshow on the topic demonstrates the kind of attention to detail a man who defuzes live bombs with his bare hands would require in order to survive in this industry for over two decades. How long does it take a landmine to rust in wet climates? How long until the expanding explosive in hot, dry climates breaks the shell around it and rendering the device inert? How much faster does the acidity in the soil move the process along? Over time, landmines break down and their appearance changes greatly. Colin’s work has implications for more realistic and effective mines risk education for children in former war zones. As the world moves beyond landmines, funding for the removal of existing mines is becoming increasingly scarce. Colin’s work will ultimately help prioritize future efforts to remove the most pressing threats to communities in former war zones and direct resources to people in the greatest danger. Special thanks: I was in the UK with Michael Lundquist, my good friend and colleague from The Polus Center for Social and Economic Development on our way to a Polus Project benefitting Syrian refugees in Jordan. For two days Michael and I were guests of Colin and his girlfriend, Mary Franck. Thanks to Michael, Mary and Colin for such a good time while we were there! Absolutely fascinating James. Keep it coming!